The coax cables on this page are made for HD security cameras (HD CCTV cameras) including HD-SDI, AHD, TVI, and CVI. 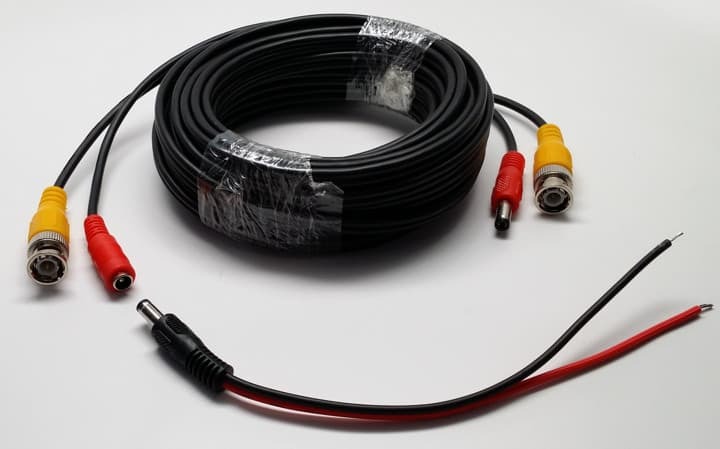 These cables will also work great with analog CCTV cameras (D1 and 960H resolution), however they are a higher quality and gauge than most pre-made cables that are made for CCTV. This is because HD security cameras (HD-SDI, AHD, HD-TVI, HD-CVI) require the higher quality and gauge to transmit the additional bandwidth required by high definition video (720p and 1080p). The cables on this page are Siamese type which allow installers to run both video and power. You will find both pre-made Siamese cables and spools of RG59 Siamese coax cable on this page. The pre-made cables are available in different lengths and already have BNC connectors and power leads attached. 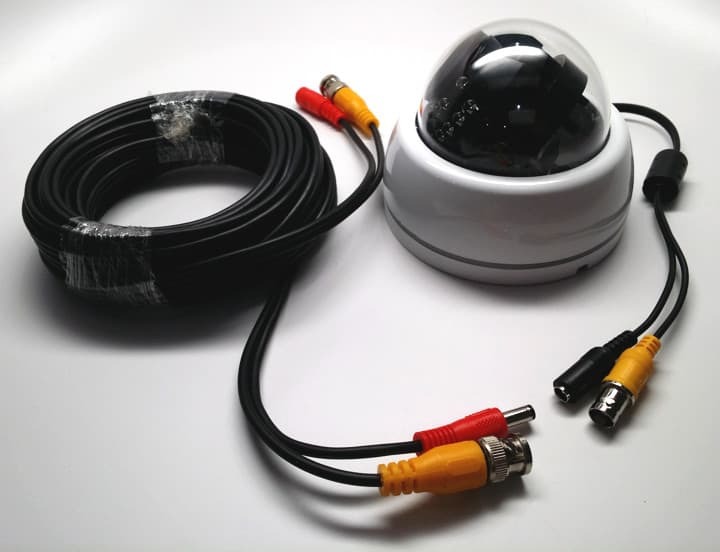 Pre-made cables make video surveillance installations more plug and play and are the best choice for DIY installers. 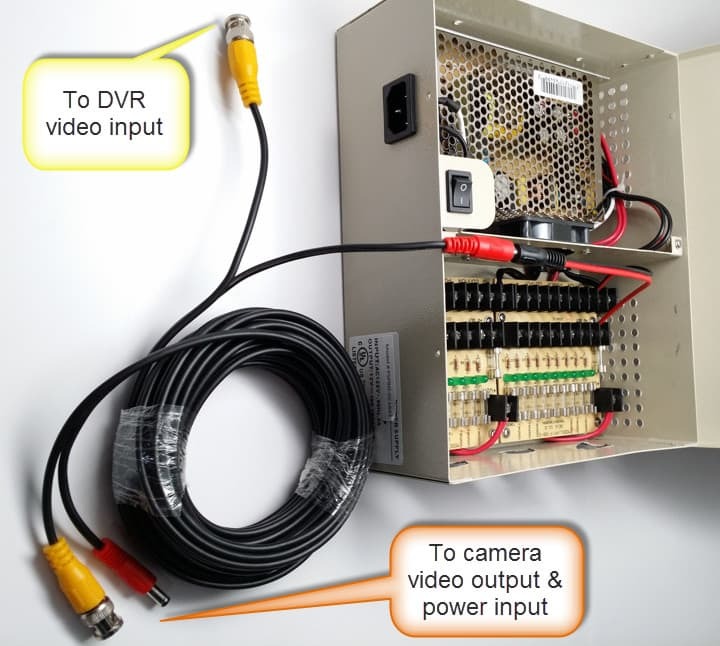 Click here learn how to connect pre-made cables to cameras, DVRs, and power supplies. You can not cut the pre-made cables. Another cable option for HD CCTV cameras, is to use spools of RG59 cable. 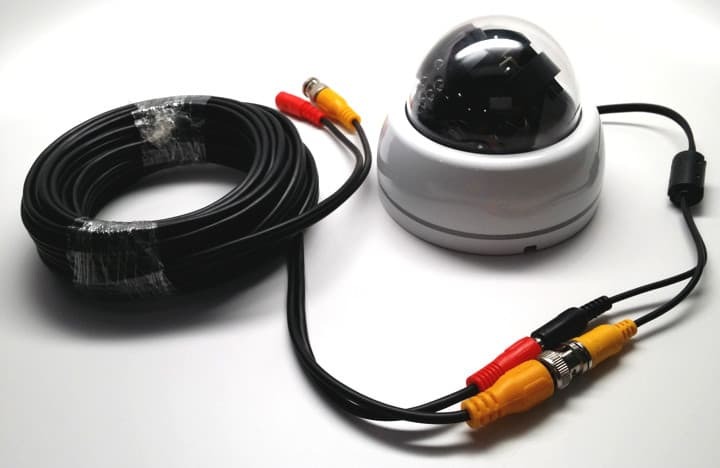 CCTV Camera Pros has 500 and 1000 foot spools available. We also sell packages that include BNC connectors, cutting tool, and crimping tools. You can watch videos on how to attach BNC connectors to RG59 coax cable here. 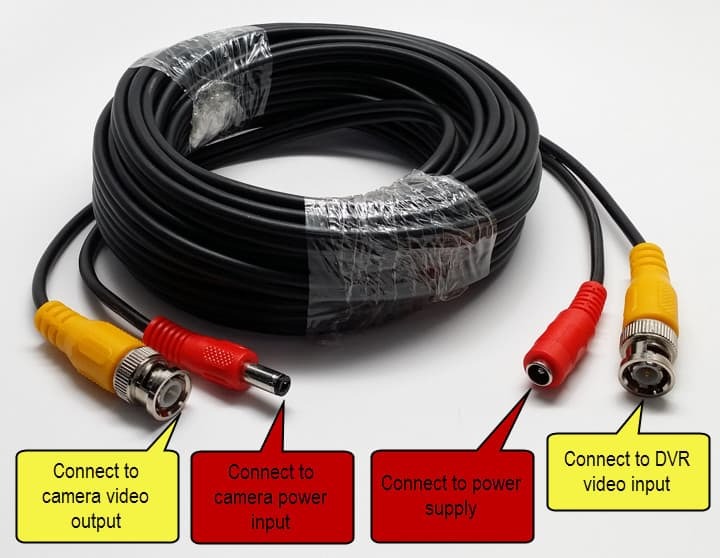 Follow these instructions to learn how to connect pre-made Siamese cables to security cameras, power supplies, and a surveillance DVRs. Reference this diagram to note which end of the cable connects to the camera and which connects to the DVR. The BNC connector on the camera end of the cable simple pushes and twists onto the BNC connector of the camera. The power lead of the camera simply pushes onto the power lead of the Siamese cable. This is what it looks like when the cable is connected to the camera. If you are using an individual power supply, this is what it looks like when you connect the power supply to the cable. The BNC connector will plug into one of the BNC video inputs on the back of your DVR. 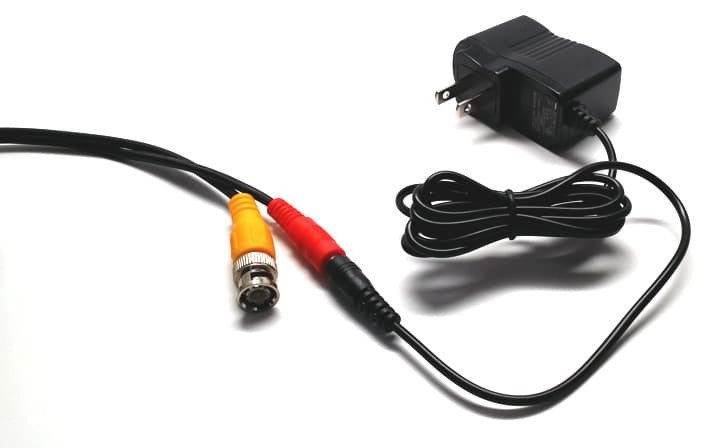 If you are using a power supply box with pre-made cable, you need to attach a PT-3 power lead to the DVR side of the cable. This is because power supply boxes do not use the 3.1mm plug connector on the cable. Power supply boxes have + / - screw terminals. 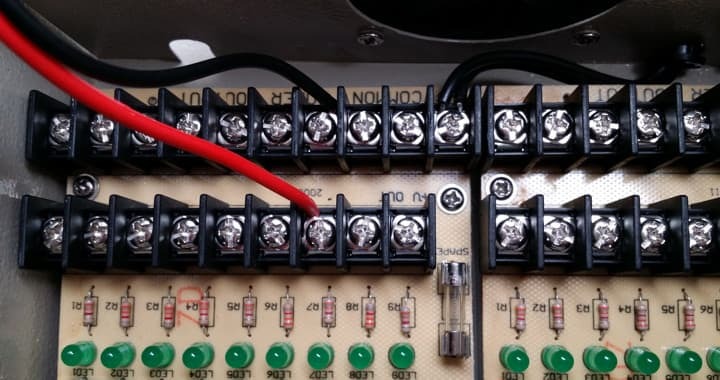 This video uses a very popular method of attaching a BNC connector to RG59. The installer first attached a male F connector (compression type) to the cable. Then a BNC male to F female is screwed on. This technique is popular with security installers because compression connections are known to be extremely secure and F compression connectors are very easy to attach. Installers can then attach a BNC end or an RCA end to the F connection. This video shows customers how to attach a 2 piece BNC crimp-on connector to RG59. This is another very popular method for attaching BNC male connectors to RG59 and RG6 coax cable. This technique provides a very secure and reliable connection that will last. This video shows customers how to attach a BNC twist-on connector to RG59. One of the nice things about twist on type connectors is they do not require any special tool to attach them besides a coax stripper tool.